Quick - name a Belgian Pale Ale. I've been a beer geek for years, but I had a hard time coming up with one on my own. For most styles, I find it pretty easy to come up with a commercial example, but for this style I needed google to help me come up with one. The impetus for brewing this beer was a Basic Brewing Podcast where the same wort was fermented with various Belgian strains of yeast, and the Wyeast 3522 Belgian Ardennes yeast was the standout in the bunch. My wife had asked me to brew an American Pale Ale for her and her friends, but I really wanted to try that Ardennes yeast, so I had the idea to make an 8 gallon batch of base wort, and then brew 2 very different beers with it. The first half was boiled down to an OG of 1.055, hopped with American hops and fermented with 1056 so that my wife would have her beer. The other half was concentrated to 1.052, hopped with Styrian Goldings and fermented with the 3522 yeast. When the beer was finished, I was blown away with how much I liked it. 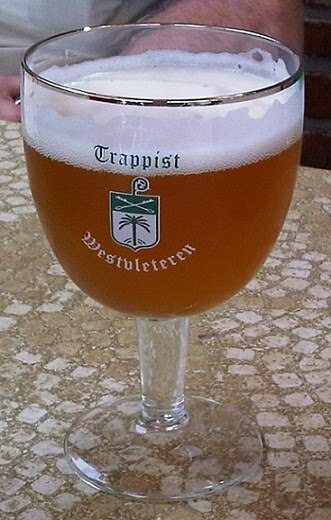 It had lots of the flavor characteristics that I look for in big, bold Belgian beers, but it was about 5.5% ABV. It made me wonder why I didn't drink that style of beer more often. When it came time to come up with a name for my beer, it occurred to me that Big Sky had a similar problem when they started brewing their American Brown Ale. It was a style that tasted fantastic, but needed something to get people to try it. It worked for Moose Drool, so I thought I'd try it with Monk's Drool. Of course, the Abbay of St. Sixtus doesn't have to come up with a clever name to get people to try their Belgian Pale Ale, but they are in a unique position. Mash for 1 hour at 152F, mash out at 170F. After fermentation is finished, let it sit for several days to give the yeast time to flocculate, then keg and force carbonate to 2.6 volumes of CO2.